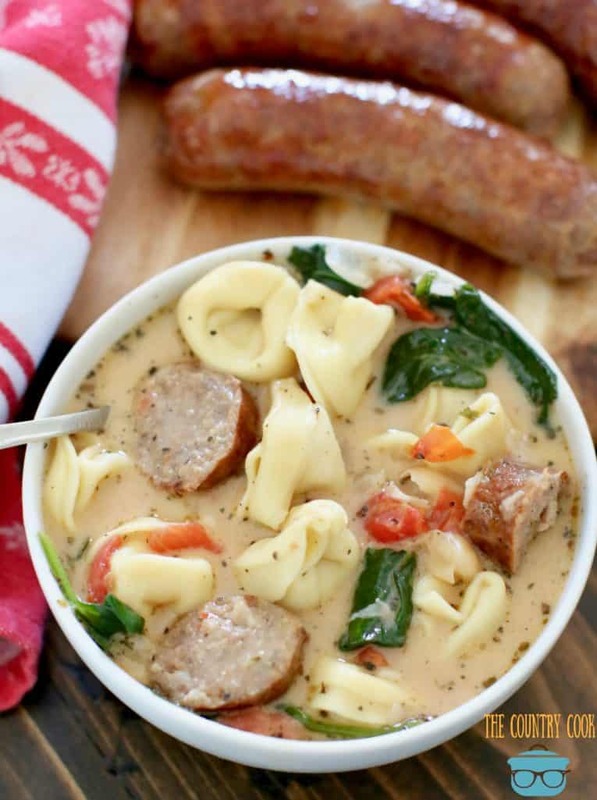 Y’all, I tested this recipe for Creamy Tuscan Sausage Tortellini Soup several times to make sure I had the seasonings just right. 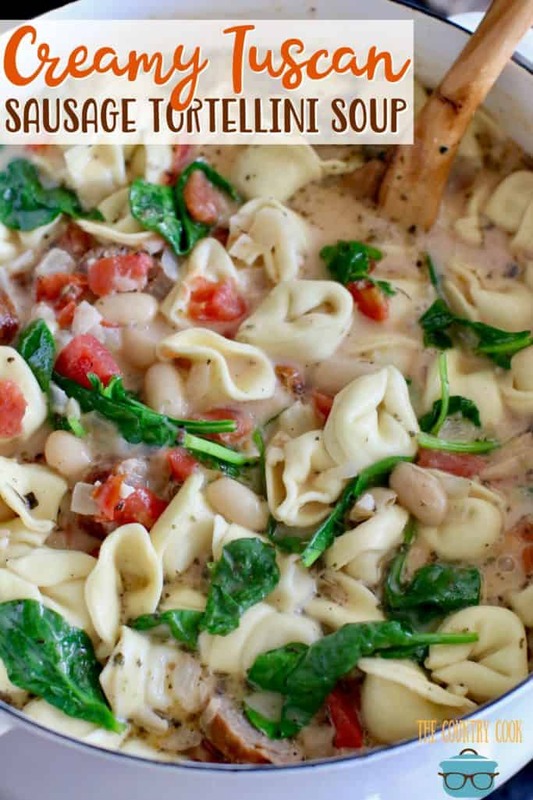 I had originally thought this recipe would just be with the cheese tortellini but I wanted to make it a bit more heartier and filling. So I added Italian sausage to it and it took it over the top! 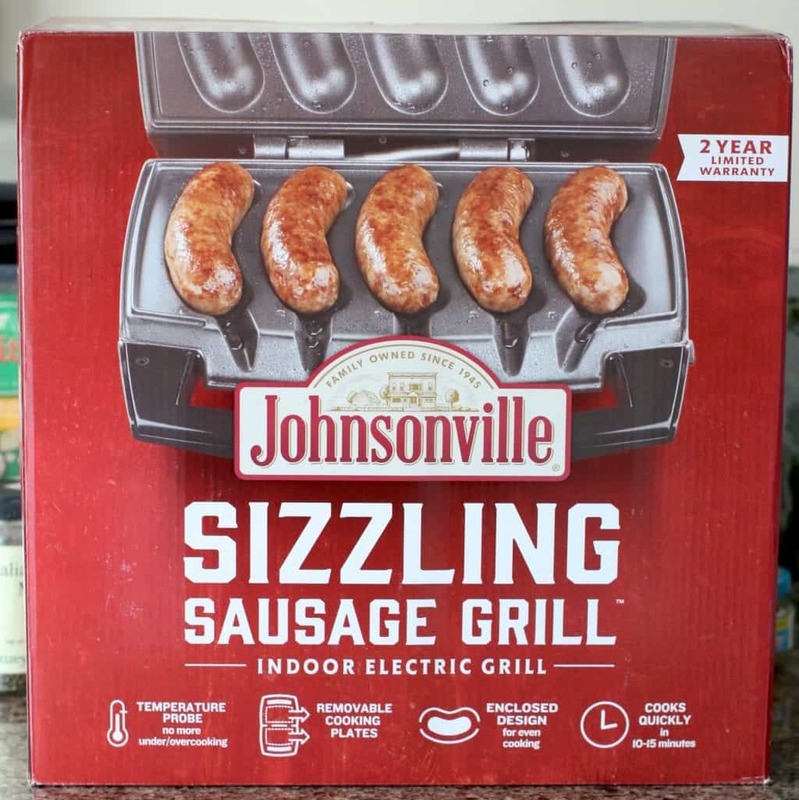 It’s a guaranteed winner and it’s all thanks to perfectly cooked sausages made in my Johnsonville Sizzling Sausage Grill. You may have seen me use this indoor electric grill for my Sausage Baked Beans as well as Italian Sausage and Peppers. 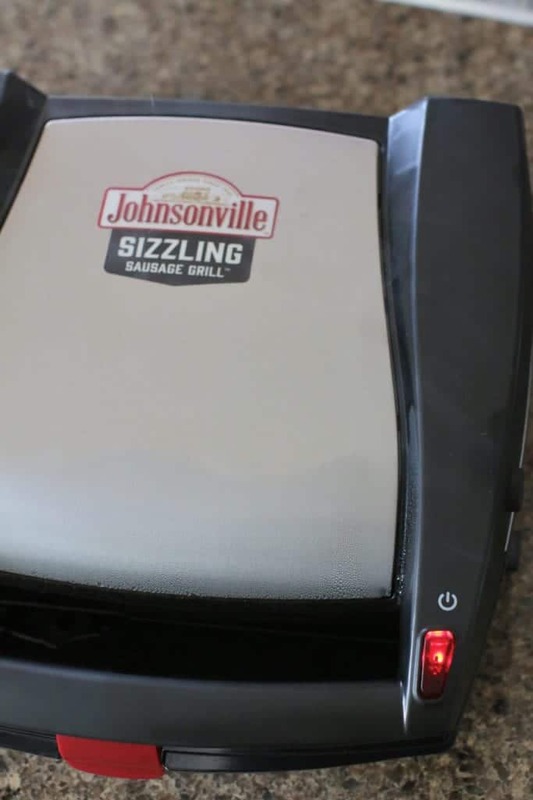 The Johnsonville Sizzling Sausage Indoor Electric Grill works anywhere there is an electrical outlet and is easy to transport. 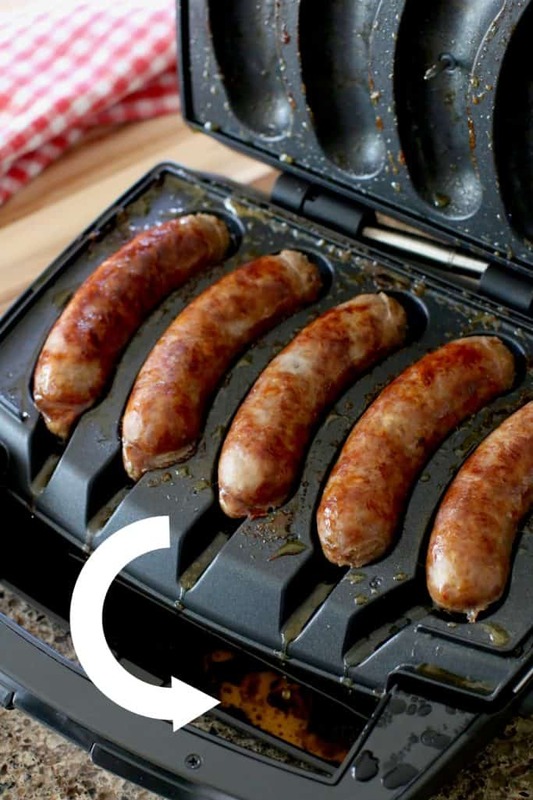 The grill has an enclosed design that seals completely when locked so that the sausages are cooked and browned evenly, the juices and flavor don’t escape, and no drippings splatter outside the grill. Because of the internal thermometer, it knows exactly when the sausages are cooked. And any excess grease drips right down into the drip pan below. The plates pop right off for easy clean up and can be put right into the dishwasher to be cleaned. Boom! 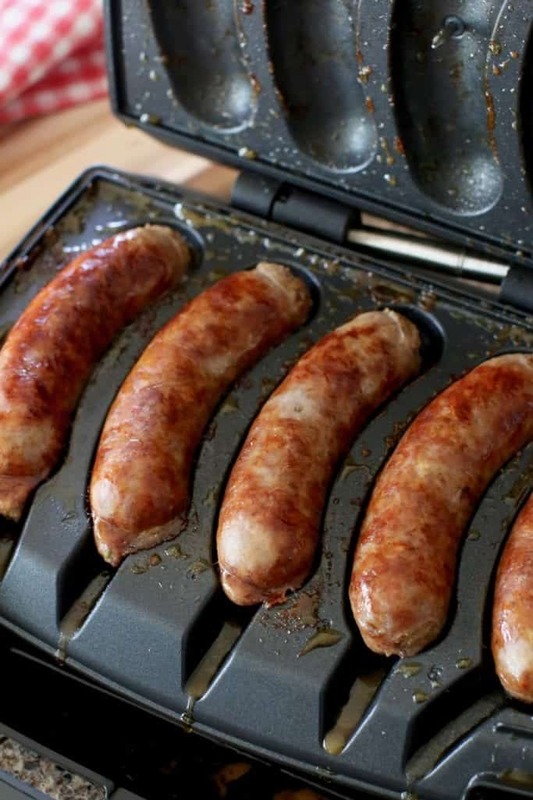 We enjoy eating bratwurst (brats) often so this little baby gets a lot of use in my house. It will be a huge hit for anyone in your life! This time I used it to make this delicious soup. I know it will cook the sausages perfect every time but it also frees me up so I can get started on the soup while the sausages cook. I don’t have to worry about flipping them or accidentally burning the outside while the inside is still raw. 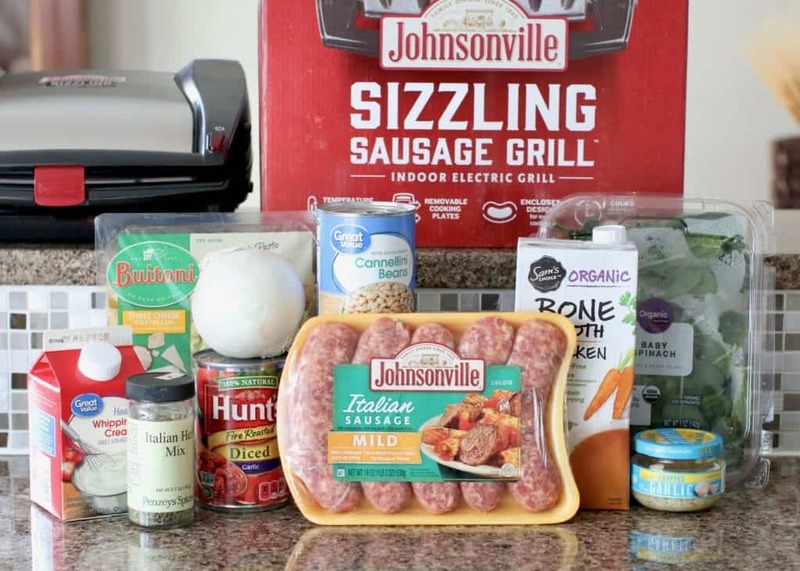 Place five Johnsonville Italian sausages in your Johnsonville Sizzling Sausage Grill. Shut the lid (making sure the it clicks closed.) Then turn on the red power button. The grill will begin cooking the sausages to perfection thanks to the internal thermometer. It will beep when the sausages are perfectly cooked. Allow the sausages to cool slightly, then slice. In a large pot over medium heat, heat oil. 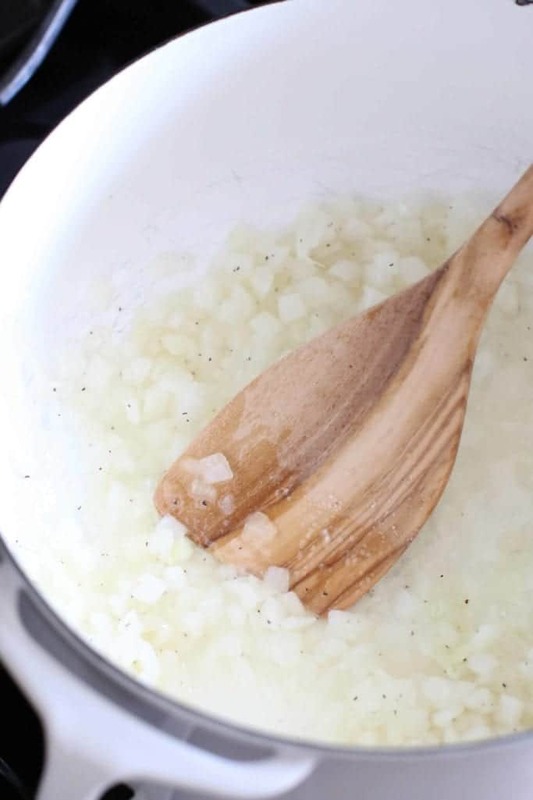 Add onion and cook, stirring, until soft, about 5 minutes. Add in minced garlic and cook for an additional minute. Season with salt, pepper and Italian seasoning. 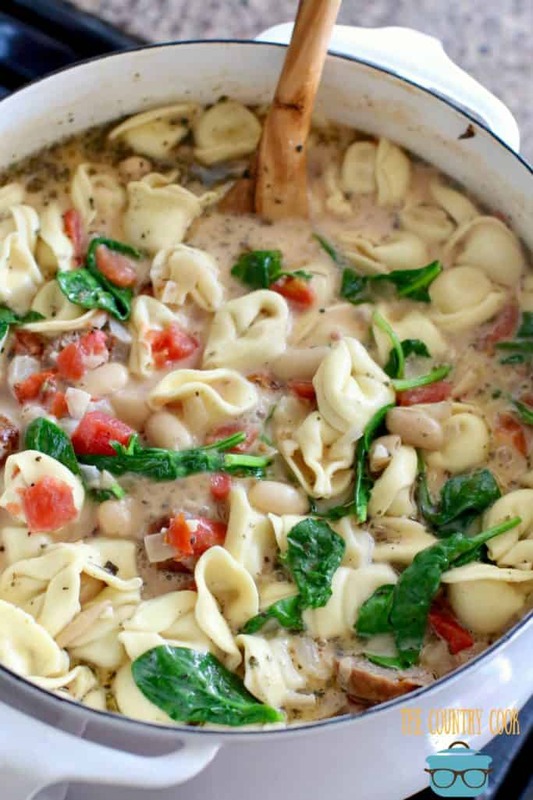 Stir in white beans, diced tomatoes, and chicken stock. Bring to a gentle boil and add tortellini and sliced sausages. 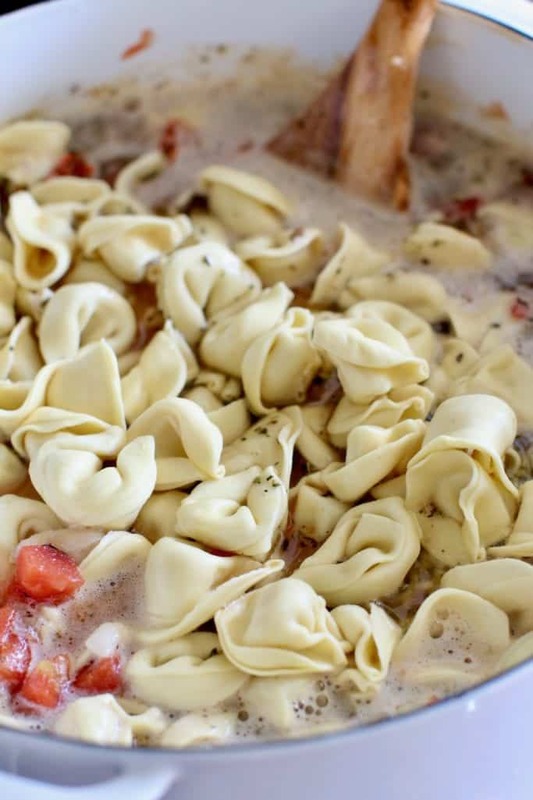 Reduce heat to medium-low and simmer until tortellini is cooked and flavors start to meld, 18 to 20 minutes. Taste-test soup for any additional seasoning (careful – it’s hot!) and add in additional salt, pepper or Italian seasoning, if necessary. 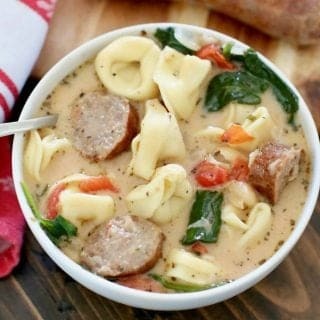 Creamy Tuscan Sausage Tortellini Soup is a hearty soup that is stuffed full of cheese tortellini, Italian sausage in a cream-based broth. 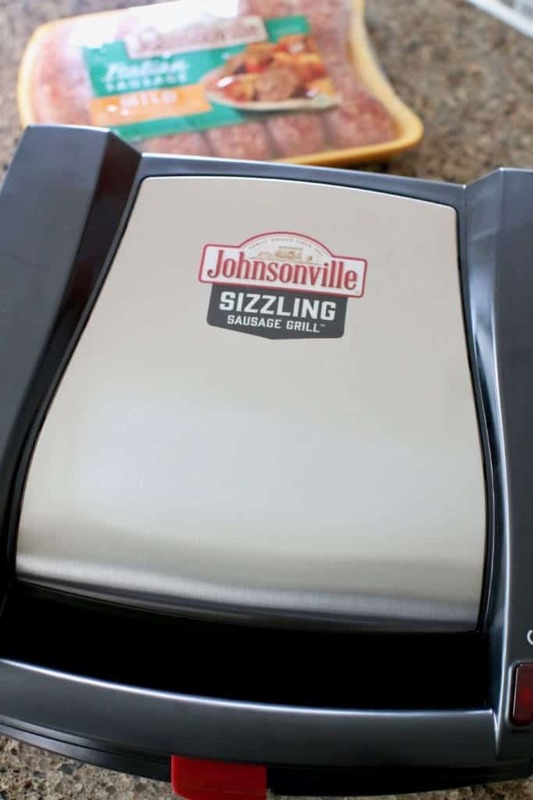 Cook sausages in Johnsonville grill - slice when finished cooking. In a large pot over medium heat, heat oil. Add onion and cook, stirring, until soft, about 5 minutes. Add in minced garlic and cook for an additional minute. Season with salt, pepper and Italian seasoning. 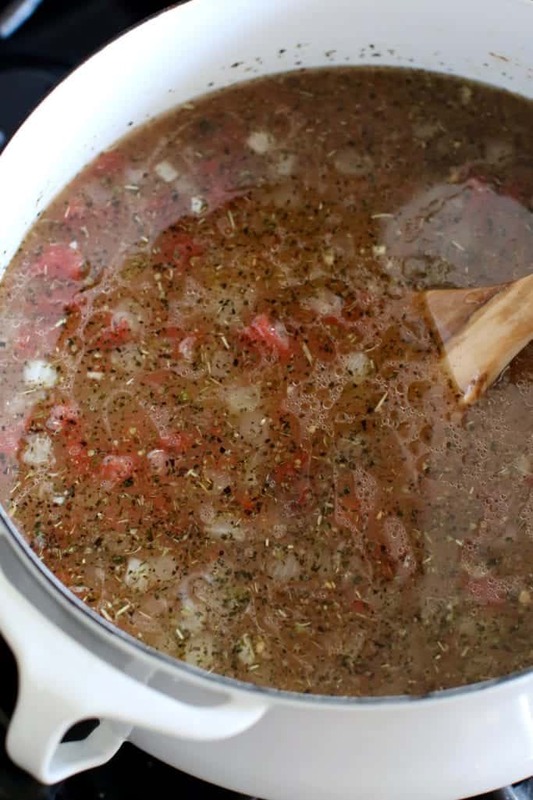 Stir in white beans, diced tomatoes, and chicken stock. Stir in heavy cream, cook for an additional 5 minutes. 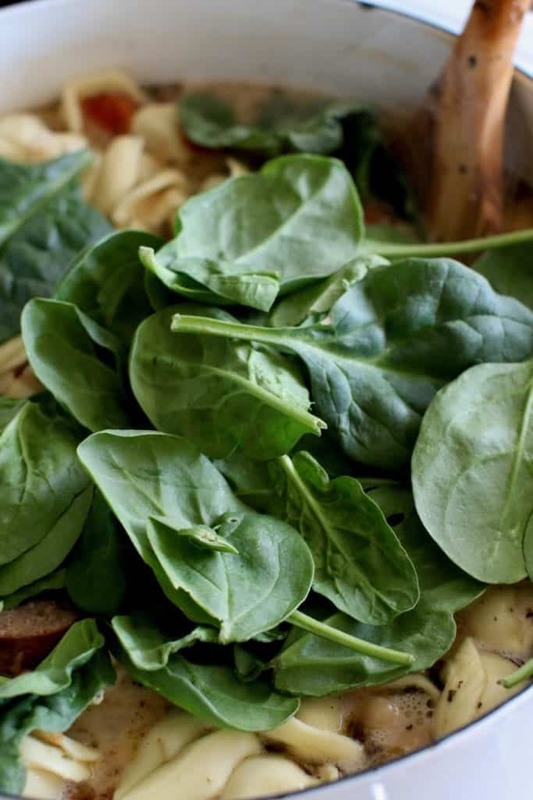 Finally, stir in spinach and cook until spinach has wilted, about 2-3 minutes. Taste-test soup for any additional seasoning (careful - it's hot!) and add in additional salt, pepper or Italian seasoning, if necessary. My 2 sons will be living together next year at college. 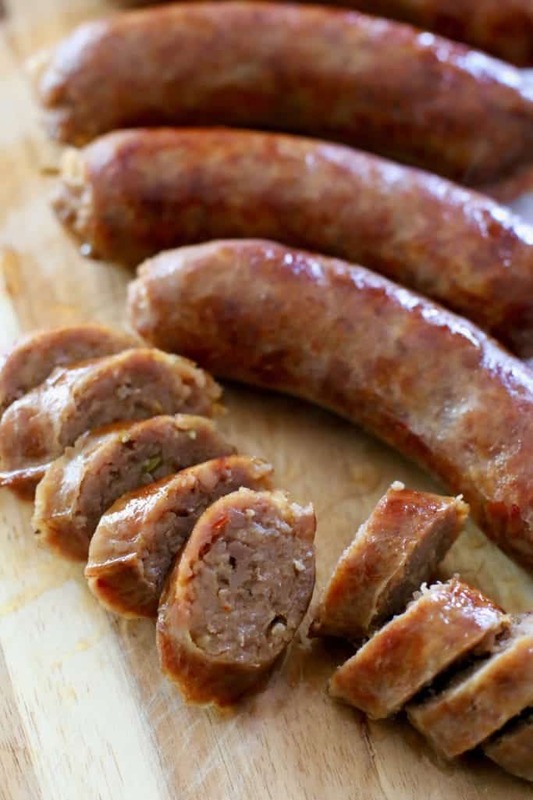 I’d give it to them…they love brats! I love it. Would be amazing to have!!!! I would keep it for me to use for my family. Would have to keep for myself since I would be doing the cooking, but bet I could teach hubby once he sees how easy it is. 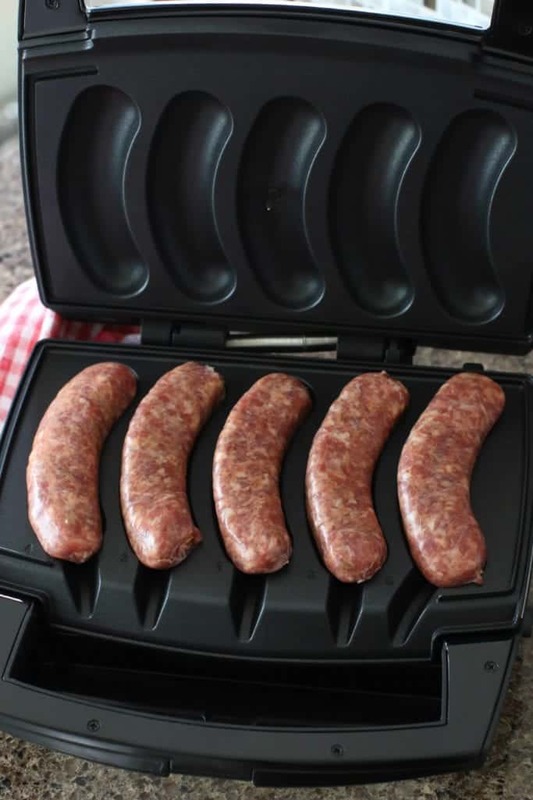 I will make this next week even if I don’t have the sausage grill, but it would be helpful! 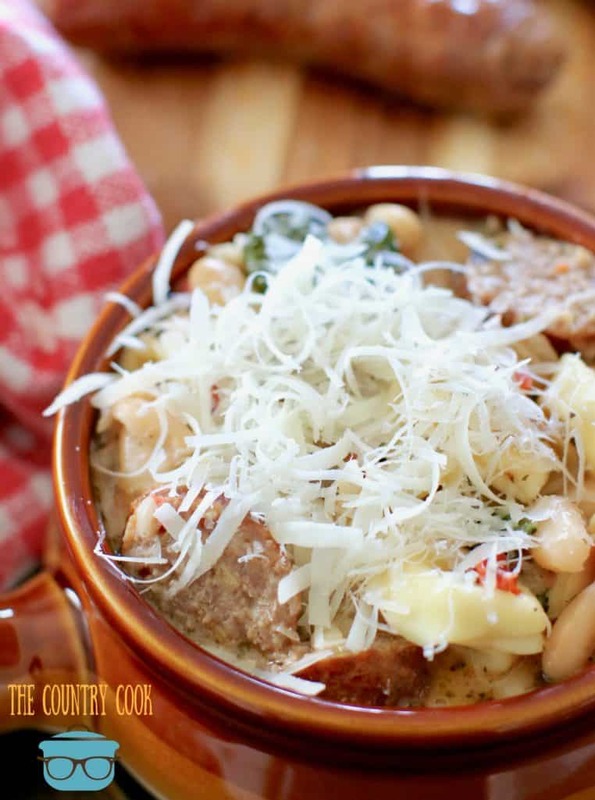 Making this for dinner tonight, however will not use Johnsonville, always had up until they took the fennel out of their sweet Italian sausage.